A discussion of the plans for rail service to the Monterey Peninsula. It's in our Gift Shop! Show your support for the Del Monte and this website. Beginning in 1880 Southern Pacific's Del Monte Express (reputed to be SP's first "name train") brought travelers to Monterey from San Francisco. In later years the name was shortened to Del Monte, and it had a loyal customer base until its demise in 1971. Every year since, local citizens and governments have made various efforts to revive the train, so far without success. California's transportation networks are overstressed. It is becoming widely accepted that there will never be enough money or land to pave our way out of the problem. Rail has been underutilized, so it offers a cost-effective way to provide alternatives for the traveling public. Even for those who may never ride a train, every increment of rail expansion will lessen the burden on roads and airports, helping to make travel on all modes that much easier. In 1990 California voters passed Proposition 116, which provided start-up funding for various rail projects in California. The Del Monte revival was specifically included in this measure. That got the ball rolling. Pacific Surfliner Corridor between San Diego and San Luis Obispo. San Joaquin Corridor between Bakersfield and Oakland/Sacramento. Capitol Corridor between San Jose and Auburn via Sacramento. Coast Corridor between Los Angeles and San Francisco/Oakland. It includes Monterey County. The first three corridors have already seen significant development since the early 1990s, and they have proven to be highly popular. The Capitol Corridor in particular is now the nation's third busiest rail corridor, and the fastest growing. Given the success of these trains, not to mention the increasingly hectic traffic on the freeways, it is likely that Monterey Peninsula residents will want to be connected to this network sooner rather than later. 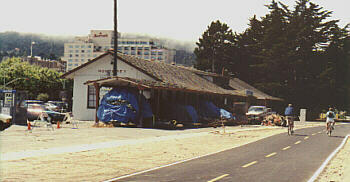 The old Monterey passenger depot at Fisherman's Wharf. The city has since leased the building to a retailer. In the fall of 2003 the Transportation Agency for Monterey County (TAMC) purchased the Monterey Branch Line, the former Southern Pacific right-of-way, from Castroville part way into Seaside. The tracks are in disrepair and TAMC will need to rehabilitate the line before any service begins. The Salinas River bridge will require seismic retrofitting before the Marina-Castroville segment can be utilized. 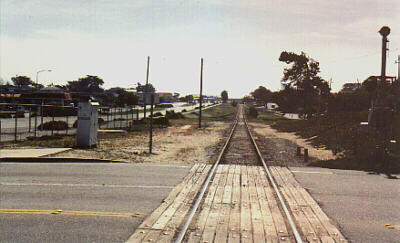 The remaining right-of-way from Seaside to the Monterey depot by Fisherman's Wharf had already been purchased by those two cities in 1980. Funding was provided by Caltrans under the condition that the right-of-way be kept available for future transit development. Because such development did not occur in the original timeframe, city leaders of Seaside and Monterey agreed to a 50-year extension of the agreement in 2000. 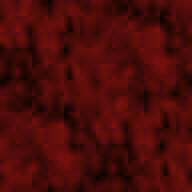 (A copy of the agreement can be downloaded here.) The popular recreation trail between Canyon Del Rey and Fisherman's Wharf occupies part of the 100' wide right-of-way. Rail service would not require removing the recreation trail, but will require some realignment of it. After the Castroville-Seaside segment was finally acquired it was TAMC's intent to revive the Del Monte service between the Monterey Peninsula and downtown San Francisco by 2009. Of course that didn't happen. Based on the results of public meetings and discussions with local city governments, TAMC has all but abandoned the Del Monte revival in favor of using the Monterey Branch Line to supplement local transit services with a light rail commuter vehicle, essentially a streetcar service. This strikes Mr. Toy as rather odd because he has not found many people among the local citizenry who want to travel between local cities by rail. But he has talked to many who want a train to the San Francisco bay area to avoid the increasingly hectic freeways. Monterey Peninsula city councils, however, have been openly squeamish about bringing full sized passenger trains through their quiet little towns. This is ironic considering that both freight and passenger trains were common sights when these towns were smaller and quieter. Marina has been the most vocal in this regard, and there has been some concern in Monterey about utilizing the rail right-of-way there because it runs through the "Window on the Bay" park. However, the right-of-way agreement cited above specifically states that the city must not consider the park and rail development to be mutually exclusive. The prevailing opinion at TAMC suggests that local light rail would fill the need for intercity service from Monterey by providing a connection to proposed San Francisco-Salinas intercity services at Castroville. However, this would require that passengers and their baggage transfer between trains, resulting in unnecessary inconvenience and adding to overall travel time. Mr. Toy doubts this would provide an attractive alternative to driving. As TAMC envisions things, light rail service would initially run between Marina and downtown Monterey, with 13 stations along the route. Four would be in Marina, two would serve CSUMB and the former Fort Ord, two in Sand City, and five in Monterey. For reasons unknown, none have been proposed for Seaside! Service would be extended from Marina to Castroville at a later time. TAMC also considered paving over the tracks and using the corridor as a dedicated bus lane, called bus rapid transit. However, TAMC rejected that option as less cost effective. Under TAMC's light rail plan future intercity service is still possible, but at this point it appears to be highly unlikely. Had TAMC chosen bus rapid transit, it would have eliminated the possibility of bringing intercity rail services to Monterey. So unfortunately, what we're reporting now is a significant change from what we were discussing when this web page was first published a few years ago. TAMC told us back then that we would see the Del Monte up and running by 2006. Soon after it was pushed back to 2009. Now TAMC says nothing will run on the Monterey Branch Line before 2015! These perpetual delays inspired our current motto, "Dude, where's our train?" along with the depot graphic depicting a figure staring at empty tracks. For further reading see the official page of the TAMC Rail Program.